During christmas break, I checked my (very) old personal Java applications. One of the first comments was from 2001. A long time ago. I had no UI framework, no testing framework and no automatic build process. All was hand-made I was amazed that I could read and edit the source code without problems. One of my biggest and first applications, that I wrote for my personal use, was "MP3Tool". It is a tool to manage (very) large MP3 inventories, it has cool automations, supports offline edit/merge via XML, supports database loading and has command line support. It has support for ID3v1 and ID3v2. I have implemented my own library to read and write ID3 TAG infos (not complete, but works still great). The tool is a "developer" tool that is not very user-friendly, but it is 11 years old and has tons of features. 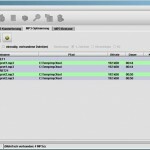 It was developed from a developer for a developer If someone needs a Java tool for mass editing of MP3 Files - here it is. It is not Open Source because it was not relevant in 2001. It is Free for everyone and if someone needs the source code it should not be a problem to upload it somewhere. 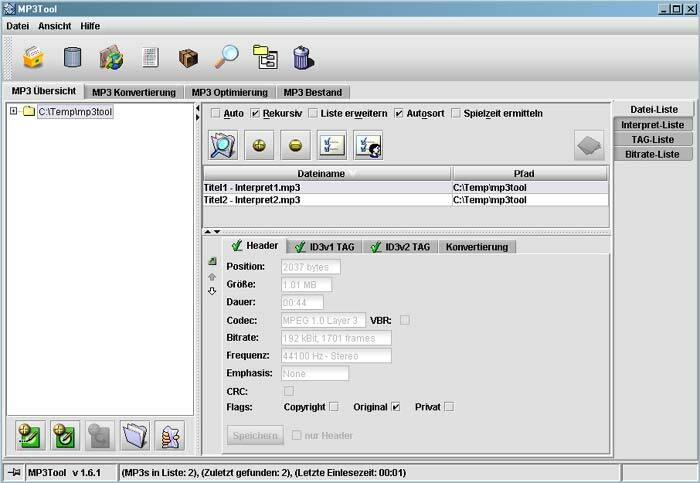 The tool has a German and English language file. I don't know if the auto detection works but you can change the language file in the settings, via Toolbar. I have not tried it on MacOS, but used it very often with Linux. If you search documentation - I have never used one! I use the tool from time to time and still love it because it just works. After 11 years, I think it is ok to share it with you.